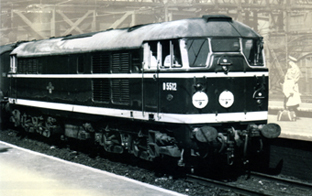 Information: Originally classified as Type 2 and later re-classified under the TOPS system as Class 30 locomotives, but subsequently rebuilt as Class 31; the locomotives were introduced in 1957. Variants of the class were still operational in 2009; although since that time remaining members are fast disappearing from the railway landscape. Details: Classified by British Railways as Type 2 diesel electric locomotives; In 1955 British Railways placed an order for 20-units with Brush Traction in Loughborough for evaluation of a mixed traffic design as part of the British Railways diesel Pilot Scheme. The prototype, numbered D5500 was released from production in September 1957. Equipped with a Mirlees V-12 diesel engine, the A1A-A1A wheel arrangement had only four powered axles. Electric transmission systems were mounted over the center axle of each bogie. The original design was built around a top speed of 80-MPH; this proved too restrictive and as such the existing units were re-geared for 90-MPH operation. The locomotives were sturdily built, but very heavy for their size. Primarily designed for workings in the Eastern Counties; the locomotives eventually found work over all the Regions and on all types of workings. After 15-units were completed the decision was made to scrap the Pilot Scheme and the lengthy evaluation process while moving forward with full production, as the revised Modernization Plan called for elimination of steam traction by 1968. Ultimately a total of 263 units were produced, the last emerging ex-works in October 1962. By that time the Mirlees engines were already proving troublesome. A decision was made to replace the engines with English Electric 12-cylinder units. Engine replacement took place at BR works in Doncaster over a five year period and was completed by 1969. As such the locomotive was reclassified under the yet to be implemented TOPS code from Class 30 to Class 31. The Pilot Scheme locomotives differed from later units in not carry head-code boxes. With few exceptions, this visible distinguishing feature remained with the early production units through their history and these locomotives were often referred to, rather unkindly as “skin-heads”. A wide variety of colour schemes have been applied to Class 31’s. Originally they were turned out ex-works in an attractive two tone green with numbers at one end only. Subsequently yellow warning panels and off-white window surrounds were added, along with numbers being applied to both cab ends. Several experimental liveries were applied in early years to various members of the class; D5578 released in electric blue and D5579 in bronze-gold. By 1966, locomotives were being re-painted in the Corporate Blue with full yellow ends. By the late 80’s British Railways Sectorization Plan saw a wide variety of colour schemes applied, including Railfreight grey, Regional Railways blue and white, Executive grey, etc. By the 1990’s an even wider array of colour schemes were applied as remaining units were deployed amongst the newly appointed Private Operator companies. Withdrawals began in 1975 when renumbered 31150 met with an accident. The doyen of the class D5500 (re-numbered 31018) was donated to the National Railway Museum in York in 1976 at the same time the original batch was decommissioned. By the early 1990’s newer motive power and further lines being equipped with DMU/EMU services displaced even more units. Whilst the remaining units lasted into the 2000’s at least 20-units survived in main-line operation through 2009 with some hope for preservation.